Buddy, like most toddlers, loves to move! His energy is limitless and he is happiest when he is running, jumping, climbing or throwing. 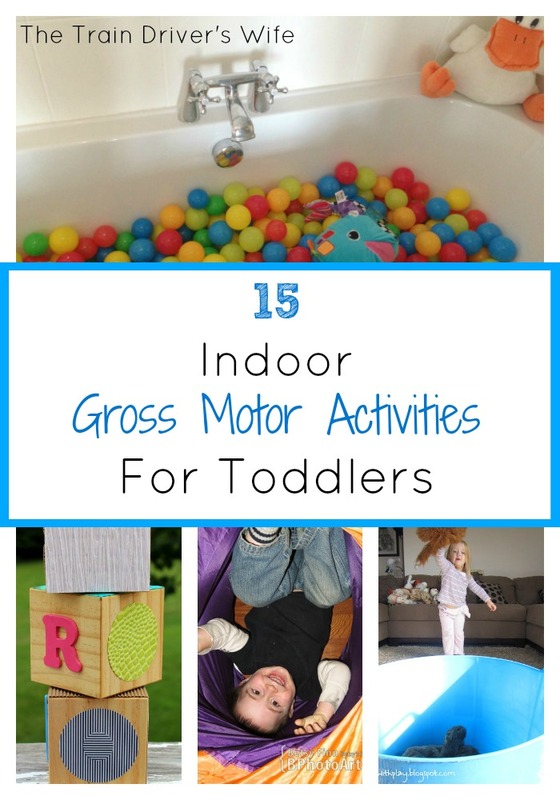 Now that we are in the depths of winter, it has been fun to find indoor gross motor activities for Buddy to enjoy! We love all of these activities. They get Buddy moving, they use up lots of his energy and guarantee a good nap time! Get climbing, tumbling and moving through this Ball Pool Bath Gross Motor Play. Throw, climb and chase these lovely Texture Blocks from Fireflies and Mudpies. Imagination is the order of the day with this super fun Walking on Mars Gross Motor Play from My Mundane and Miraculous Life. Crawl, stomp and rip with this simple Newspaper Gross Motor Play. Your Toddler can practice their driving skills with this fun Indoor Road from The Eyes of a Boy. There are so many ways to play with balloons and you can check them all out here. Balloon Gross Motor Play from Betsy Finn Photography. Practice language and movement with this fun Motor Skills Preposition Game from Totschooling. This Imaginative Play Tunnel from Betsy Finn Photography looks like super fun and a guaranteed way to gets little ones moving! Reach and stretch with this fun Giant Threading Activity from Adventures of Adam. This fun Soft Toy Toss from Learn with Play at Home is a super simple and effective way to get your little ones moving. Your toddler can really get their groove on with this Move and Groove activity from Betsy Finn Photography. Get dancing and moving with these awesome Gross Motor Movement Songs from Lets Play Music. Help your toddler move and learn about different textures with this simple Textured Sensory Wall for Toddlers from Hands On As We Grow. This Indoor Obstacle Course from Bambini Travel is an amazing way to encourage little ones to get moving! This is such a fun and simple activity for little ones! Follow the yarn to play Teddy Bear Hide and Seek from Munchkins and Moms. I hope you will enjoy these activities as much as we have! Buddy is certainly exhausted after trying most of these which means that this pregnant Mama gets to nap! If you enjoyed these activities why not check out our 15 Indoor Fine Motor Activities for Toddlers,15 Indoor Arts and Crafts for Toddlers or our 15 Indoor Sensory Bins for Toddlers and come back soon for our 15 Indoor Simple Play Activities for Toddlers too! What a great list of activities! Thank you for including our “Where’s Teddy Bear?” Activity! We absolutely love it! Buddy and I will be having a go tomorrow.